GOOD BACTERIA + GOOD FUNGI = TOTAL GUT BALANCE BIOHM is the only probiotic designed to combine good bacteria and good fungi with a powerful enzyme to break down digestive plaque and address total gut balance. 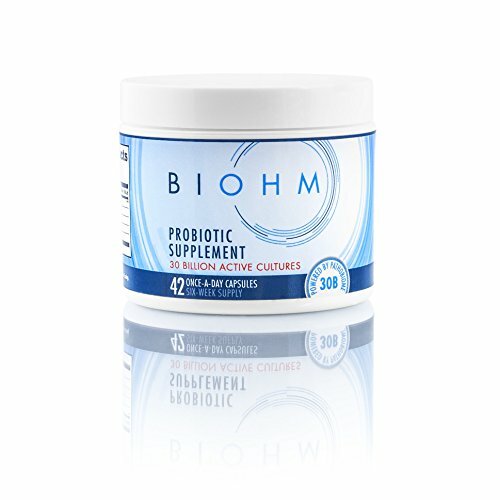 BIOHM’s dual action technology works by first breaking open digestive plaque, and then neutralizing the bad bacteria and bad fungi, which allows your gut to maintain its natural microbiome balance, supporting optimal digestive health. Our trademarked formula contains 30 billion live cultures of bacteria, including B. breve, L.acidophilus and L. rhamnosus; fungi, including S. boulardii; and enzymes, including Amylase. Our formula is also vegetarian, non-GMO, gluten free, soy free, egg fee, allergen free, and has no artificial ingredients or sweeteners.